for background information on the missing Pentagon Tapes. FOIA actions against the FBI has the FBI claiming that the Virginia DOT tapes and the Citgo Station tapes were confiscated but not the Sheraton Hotel tapes. However, plaintiff Bingham interviewed Sheraton employees who verified the FBI confiscation of the hotel tapes. One source claims Sheraton management denies such tapes. Attorney Peter Gersten, who filed the second FOIA action, claimed VDOT management denied having tapes confiscated even though the FBI said such tapes were indeed confiscated. Below are the links to 1) the FBI's latest response to my request for three CCTV videos allegedly showing the crash of Flight 77 into the Pentagon on 9-11 and 2) the appeal of the FBI's refusal to release two of those videos. Last week I called Dennis Morrison, VDoT's District Administrator, who is the person I had spoken to originally. In his letter to me dated January 31, 2005, he stated that no tapes were seized by the FBI. When I told him about the latest FBI response and their implied admission of having the VDoT tape he seemed surprised and somewhat embarrassed. He stated that if I would send him a copy of the FBI letter he would find out why his staff had told him differently. The plot thickens! "... information regarding the closed circuit television (cctv) obtained from Nexcomm/Citgo gas station, and the Virginia Department of Transportation is located in an investigative file which is exempt from disclosure ..."
"This letter is an appeal pursuant to subsection (a)(6) of the Freedom of Information Act as amended (5 U.S.C. 552)." Attorney Gersten has found that "Judicial Watch, the public interest group that fights government corruption, announced today that it has obtained documents through the Freedom of Information Act ('FOIA') in which the Federal Bureau of Investigation ('FBI') has invoked privacy right protections on behalf of al Qaeda terror leader Osama bin Laden." "It's so simple," Edmonds told TomFlocco.com. "Nobody is looking at the Department of Defense aspect of the whole 911 cover-up. SHOWTIME: Six months after 9/11 the Pentagon released screen captures from a heliport security camera NONE SHOWED THE MINOR EARLY CRASH DAMAGE. 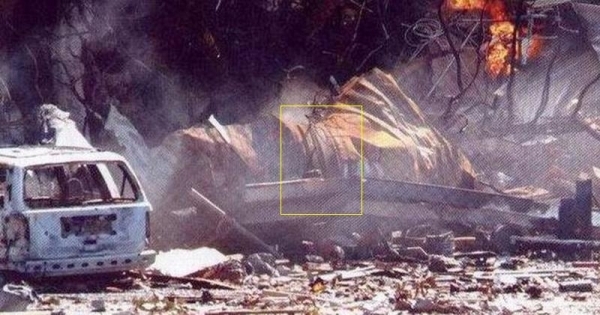 This photo shows the JT8D engine NOT from Flight 77 discovered in debris before the alleged structural 'collapse'. SEE: Missing Pentagon Jet Engine Identified. Lt Col (ret) Tom McClain : I saw the remains of the engines in the North parking lot of the Pentagon as well as melted aluminum and other debris left from the aircraft. Charles H Krohn: One of the aircraft's engines somehow ricocheted out of the building and arched into the Pentagon's mall parking area between the main building and the new loading dock facility, said Charles H. Krohn, the Army's deputy chief of public affairs. Those fleeing the building heard a loud secondary explosion about 10 min. after the initial impact. CNN reporter, Jamie McIntyre reported the collapse occurred 45 minutes after the impact. First reporter on the scene, McIntyre had his videos, photos confiscated and a FOIA action failed to return them. 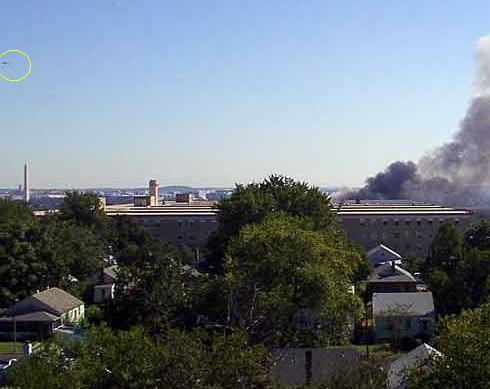 Other witnesses said the plane crash was followed by an explosion about 15 minutes later that could be heard miles away - apparently the sound of a large portion of the Pentagon collapsing. Notice the highlighted area that is the source of the massive smoke production. Firefighter Russell Dodge said. "There were two vehicles burning, along with a construction trailer - we didn't know at the time, but that trailer was the main producer of smoke on the outside of the building - and the foam truck. "Once I had [the outside fires] pretty much knocked down, then I went into the area of the first floor where all the fire was, and just trying to get on that," he said. "It was something to fight with, until we got the other foam trucks there." He said the foam units got there and concentrated on the area of the construction trailer, which was producing some severe fires and subsequent mini explosions due to highly flammable chemicals in it, then on the actual point of impact from the hijacked aircraft. "Where the plane came in was really at the CONSTRUCTION ENTRANCE," says Jack Singleton, president of Singleton Electric Co. Inc., Gaithersburg MD, the Wedge One electrical subcontractor. "The plane's left wing actually came in near the ground and the right wing was tilted up in the air. That right wing went directly over our trailer, so if that wing had not tilted up, it would have hit the trailer. My foreman, Mickey Bell, had just walked out of the trailer and was walking toward the construction entrance." Nicholas Holland, an engineer with AMEC Construction Management of Bethesda, Md., had spent the last two years working to reinforce the walls. Two summers ago, a blast wall of reinforced steel and concrete was installed right where the plane hit. It stood for 25 minutes after it was hit before collapsing, long enough for people to escape, Holland said. Another witness: The right engine hit high, the left engine hit low," Sepulveda said. 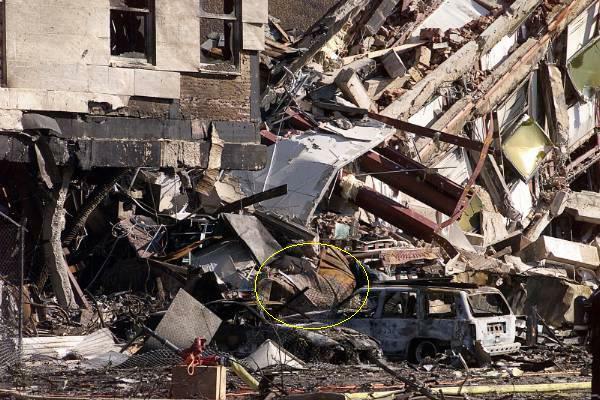 "For a brief moment, you could see the body of the plane sticking out from the side of the building. Then a ball of fire came from behind it." 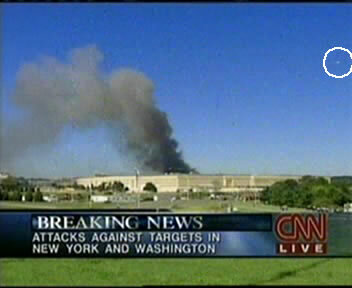 Vin Narayanan: The hijacked jet slammed into the Pentagon at a ferocious speed. But the Pentagon's wall held up like a champ. It barely budged as the nose of the plane curled upwards and crumpled before exploding into a massive fireball. investigated the helicopter operating above the South Tower before, during, and after the airliner impact. Karl Schwarz has verified that the South Tower airliner was a Boeing 737 not a Boeing 767 as alleged and therefore Flight 175 DID NOT strike the South Tower. SIMILARLY, AT THE PENTAGON a helicopter served as remote control station to aim the airliner at the construction entrance. A large two engine Bell 212 helicopter is used so as to withstand nearby blast forces and maintain stable flight. As a video signal is received from the airliner an absolutely steady helicopter is essential. PLANT (LIVE): Well, and speaking to people here at the Pentagon, as they're being evacuated from the building. I'm told by several people that there was, in fact, an explosion. I was told by one witness, an Air Force enlisted - senior enlisted man, that he was outside when it occurred. He said that he saw a helicopter circle the building. 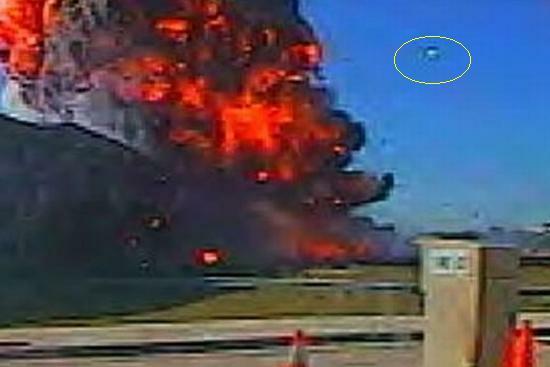 He said it appeared to be a U.S. military helicopter, and that it disappeared behind the building where the helicopter landing zone is - excuse me - and he then saw fireball go into the sky.[...] It's a very tense situation obviously, but initial reports from witnesses indicate that there was in fact a helicopter circling the building, contrary to what the AP reported, according to the witnessess I've spoken to anyway, and that this helicopter disappeared behind the building, and that there was then an explosion. That's about all I have from here. A photo taken from the Sheraton Hotel about 10 minutes after the crash. The view is over the Navy Annex with the Pentagon to the right. 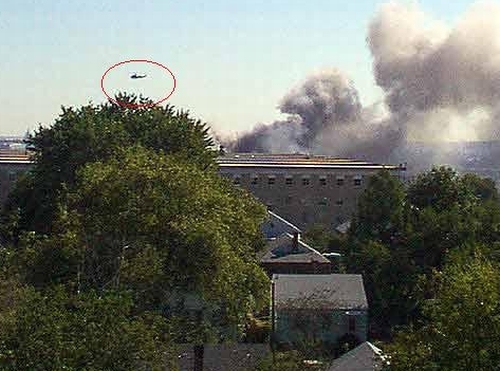 As the helicopter is going away from Pentagon and the photographer identified it as a military helicopter, this could have been the same helicopter caught by the Pentagon security camera. A Park police helicopter arrived on the scene shortly after the crash. Both helicopters carried trained medic personnel, and Eagle 2 would soon transport three seriously injured Defense Department employees from the Pentagon to Washington Hospital Center. Eagle 1, meanwhile, sent a live, moving video picture of the scene back to the U.S. Park Police (USPP) headquarters, as well as to D.C. Metropolitan Police, the Secret Service and the F.B.I. 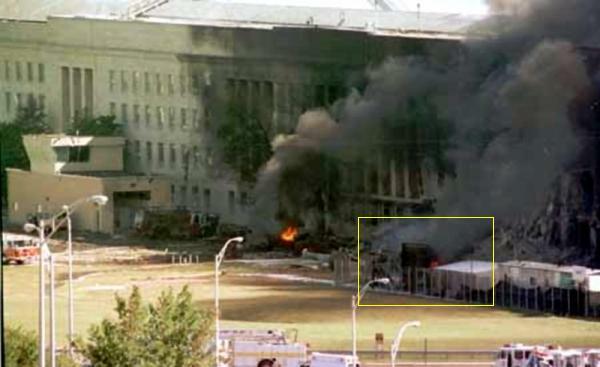 Those pictures provided instant information about the full extent of the damage and destruction that had just occurred at the Pentagon. "I looked out the window, and framed in the window of the aircraft was the burning image of the Pentagon and a fighter plane flying low-level over Washington. And I think that was the first time I took a breath and realized the magnitude of what was happening," said Sgt. Kenneth Burchell, of the U.S. Park Police. Dan R. from Indiana emailed that he has a CNN tape from 9/11 in which witnesses said a white jet was seen overflying the White House environs and that the Secret Service was concerned. 2) Meseidy Rodriguez confirms "it was a mid size plane". His brother inlaw also saw a jetliner flying low over the tree tops near Seminary Rd. in Springfield, VA. and soon afterwards a military plane was seen flying right behind it. www.karlschwarz.com for the big 9/11 picture and more. In the hardest hitting journalism since 9/11, THE POWER HOUR RADIO SHOW has totally revamped and added new analysis to an earlier video. 911 IN PLANE SITE, The Director's Cut. Visit www.policestate21.com to order. A quote from their South Tower airliner video analysis: "...there was some sort of incendiary or explosive that would serve as a match to ignite the enormous amount of fuel (when the plane hit the ST.)"
http://www.rense.com/general63/st.htm has the full story. Craig Hill also has revamped his dynamite video, Treason, Inc.